Artificial Intelligence opens new avenues for museums to engage audiences, and create a plural vision of the museum. In our latest podcast Daniel Morena, of 32Bits, discusses the Iris+ AI exhibit integration used at the Museum of the Future in Rio de Janeiro, Brazil. AMT Lab contributors have explored how geographic analysis can help increase programmatic effectiveness, but there are many ways nonprofits may leverage their data with geographic analysis. As with any data-based project, 90% of the work happens before it’s time to analyze. There are important intermediate steps a nonprofit administrator must take in order to leverage the full possibility of their address level data. Outlined below are 5 steps an administrator should take before delving into geographic analysis headfirst. Data, data all around. All this data, and what to do with it? Arts nonprofits around the country are working diligently to leverage attendance figures, donation reports, CRM systems, and social media analytics to make the most of their data. Reports are downloaded, numbers are crunched, and well-formatted excel sheets are made to identify trends and communicate organizational goals. When it comes to sharing this information with internal stakeholders, however, a picture really is worth 1,000 words (or in this case, numbers). Tableau is a business intelligence (BI) software that turns those facts and figures into accessible visual graphics, and is worth considering for your organization’s data-crunching needs. Arts managers and arts organizations strive to find ways to engage their audiences. They also benefit greatly from immediate feedback. A simple way to engage audiences and understand their experiences is to implement the use of quick response codes (QR codes). QR codes are currently used in a variety of ways to assess understanding, interests, and collect suggestions. For example, at Mie University, QR codes are used for formative assessment during the learning process. Analysis of the student responses allows the university to adjust curriculum, resources, and instruction to better meet learning needs. Organizations that wish to engage and educate their audiences often have similar objectives. Arts managers and arts organizations that implement QR codes will gain the power to adjust to audience needs and interests in order to make the greatest impact. Although there are many ways to begin making QR codes, this review focuses on QR Code Generator because it immediately collects user data, is user friendly, provides elevated customization, and is competitively priced. 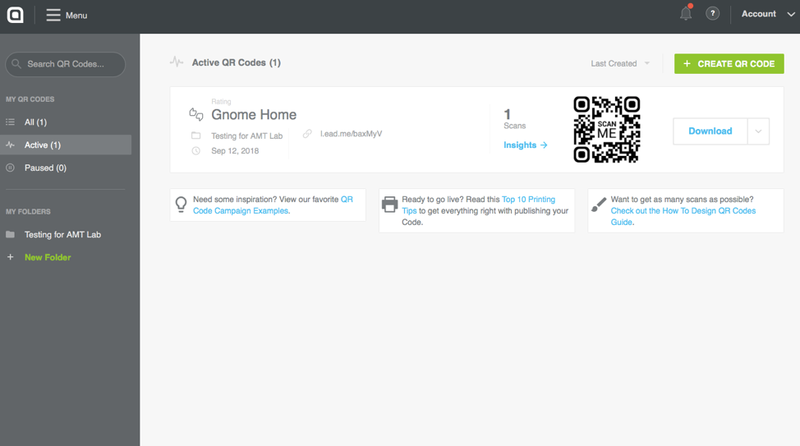 QR Code Generator is a web application software that allows users to create their own QR codes. Every time a QR code is scanned, creators receive an email. This email will be sent to the account email address. If a creator’s code involves audience participation or feedback, the email will include the audience responses. Emails are sent directly after a scan so creators can get immediate feedback. QR Code Generator is easy to navigate throughout the entire creation process. The software guides users in a straightforward sequence as they create their QR codes. Users can organize creations in different folders or search for past codes in the search field on the homepage. QR code generator offers customization that its competitors currently do not. When creating a dynamic QR code, users can create codes that connect to MP3s, videos, websites, interactive screens, as well as other options seen in Figure 2. QR Code Generator’s competitors, Unitag and Kaywa offer customization, but when trying to create codes, they were not as easy to use. In Unitag and Kaywa, there were fewer customization options, and users do not have the opportunity to manipulate the visual presentation of the code as thoroughly as in QR Code Generator. In QR Code Generator, users simply click on what they want. Printing clear and appropriately sized codes is essential to reaping the benefits of your investment in a QR generator. If audiences cannot scan the code or if the code is unattractive, it will not yield desired results. If it is not getting scanned, it will also hinder data collection. In QR Code Generator, users can download their codes as PNG, JPG, SVG or EPS files. However, if you choose to brand your code, you must download the code in PNG format. The web application software does not offer support through the printing process. It is up to the user to determine how they would like the product to turn out. However, upon my experimenting, there were no technical printing issues that arose. All prints were scannable and code size could be manipulated. QR Code Generator has three available plans as seen in Figure 4. Pricing depends on the current Euro to dollar conversion. Users can upgrade plans at any time and will receive a prorated refund. If you wish to cancel your plan, be sure to do so before the next year because plans automatically renew. If an arts manager or arts organization is looking for an easy way to increase audience engagement and/or collect information about the audience it serves, QR Code Generator is a tool to consider. Its simplicity and customization options set it apart from its competitors. Arts Managers need audience data, and the use of QR codes will enable easy collection and essential audience data analysis. “Kaywa QR Managment-Pricing.” Accessed September 17, 2018. http://qrcode.kaywa.com/page/pricing. “QR Code Generator - New Manage.” Accessed September 17, 2018. https://app.qr-code- generator.com/manage/?login=1. Susono, Hitoshi, and Tsutomu Shimomura. 1006 Current Developments in Technology-Assisted Education (2006) Using Mobile Phones and QR Codes for Formative Class Assessment, n.d.
“Unitag - Connect to the World.” Unitag. Accessed September 17, 2018. http://dashboard.unitag.io. Yarden. “Dynamic Code Vs Static Code.” Visual QR Code Generator Blog | Visualead, April 6, 2014. http://blog.visualead.com/dynamic-code-vs-static-code/. “100 Euro to US Dollar, Convert 100 EUR in USD.” Accessed September 17, 2018. https://eur.currencyrate.today/usd/100. Data collection and communication is an essential tool for effectively managing arts organizations. Data visualization techniques can reveal organizational or industry insights in a manner which is easy for managers to understand and communicate to their stakeholders. Explore sources for open source data, and low cost, high impact data visualization tools in this new white paper. As digital crowdsourced art continues as a mode of art making, it is necessary to developed an understanding of which features of digital arts programming are crucial in the engagement of digital audiences. The following analysis of four digital art projects focuses on the participatory, rather than the interactive, specifically projects wherein audiences become artists by participating in the creation of a piece of art by making one or more creative contributions. Perhaps not surprising, agency and control were identified as significant to participation. AMT Lab recently served as a sponsor for the Museum Computer Network Conference hosted in Pittsburgh, PA. Our contributors attended the conference and reported their most interesting findings in the field. This week, we're taking a look at the NEA's impact on Pennsylvania arts organizations through 8 INTERACTIVE charts.